I believe your website visitors will love this one. I built a cutting board that is not a rectangle, a square, or a circle. Instead, it's a perfect ellipse. Drawing a perfect ellipse on a board takes a little skill. The first thing you have to do is make a rectangular board from which to cut the ellipse. I like to edge glue up boards, butcher-block style, using about any scraps I can find in the shop and cut them all to the same width. My thickness planer has a capacity of 12-1/2", so I tend to stay under that final width with my cutting boards. In this case, I used 16 rows of boards, each row averaging a little over 3/4" wide and 7/8" thick. The length of the rows averaged about 18", so I planned on a final rectangle that was 12.2"W x 17"L.
Actually, all the glued-up boards do not have to be the same full length, but a couple of rules are required. Several shorts can be butted up, but those on the same row have to be the same width. Also, the outside two or three boards should all be full length to entrap the shorts. I mixed and matched hickory, ash, and cherry pieces in a somewhat random pattern, never gluing up more than three rows at a time. After planing the glued-up board to final thickness, it was time to draw the ellipse. Finding the exact center is a piece of cake, but finding the two focal points (foci), that are needed to draw the ellipse takes a little math. The foci are each located an equal distance, c, from the center along the length. 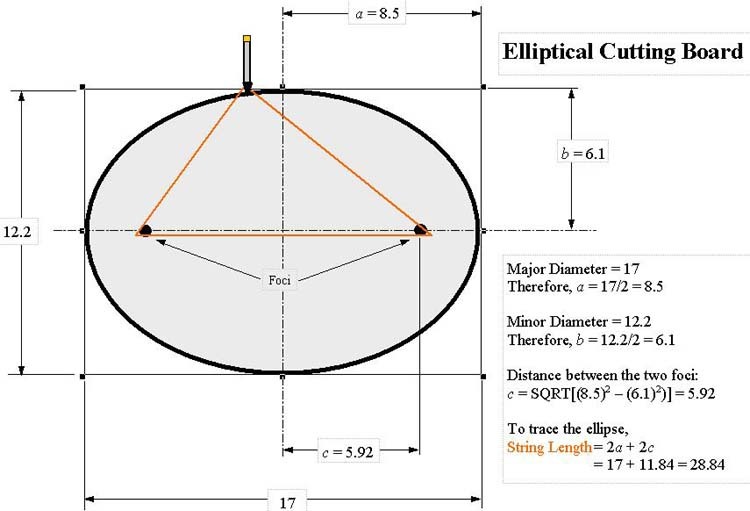 Step 1) Divide the length (major diameter) of the ellipse in half. Step 2) Divide the width (minor diameter) of the ellipse in half. In my case, c = 5.92. Next, I tacked a 4d common nail into each of the two foci locations, about 1/4" deep. To draw the ellipse, a looped string is needed so that when when you loop the string around the two nails and keep it tight, your pencil will float around and trace out the ellipse. The length of this looped string is 2c + 2a. In my case, this was 28.84". I "cheated" a little and added 1/2" to this to compensate for the bend around the nails and the end of the pencil. Then, I kept the string taut and drew the ellipse. Next, I used the bandsaw to cut out the ellipse, keeping the blade just to the outside of the trace. I used my disk sander to clean up the "washboard" on the outside edge, and my random orbit sander smoothed everything out. It's nice to have a hole to hang up the board, and this time I used the two foci for a pair of hole locations. After removing the two nails, I drilled a pair of 11/16" holes right through the foci. Using a 1/4" roundover bit, I rounded the outside edges on both sides of the ellipse and the inside edges of the two holes on both sides. Finally, I hand sanded with a 400 grit sanding sponge for about half an hour and then coated my cutting board with two coats of mineral oil, applied 24 hours apart. That completed a dandy project. BTW, keep the string that you used to trace the ellipse. You can use it along with the two holes to show people how the technique worked to draw it. It's a great conversation piece.